Michael Robertson Loses. Free Speech Wins. Freespire.com to Live on for 100 Years! When I left Linspire, I had every intention of just moving on with my life, but soon after my departure, Michael Robertson hit a new and disgusting low (even for him) by trying to have some good people arrested for simply having been laid off and given severance. (What kind of greedy person would do something like that?!?) Robertson tried to have these good people arrested and started attacking them, trying to destroy their good names, and doing everything he could to bring harm to these individuals. Well, I couldn't just stand by and watch. As the saying goes, "All that is necessary for evil to triumph is for good men to do nothing." So, I decided the world needed to know about the REAL Michael Robertson, and little by little, I started to share some facts about Robertson via my blog, and eventually started using Freespire.com to disseminate my writings. If you review the history page of Michael Robertson's Wikipedia page, you'll see Michael ("Mykill") and his family ("Leslieaudra") remove anything unflattering from Robertson's page (not to mention libeling others with false acquisitions). Therefore, I felt it was important that there was a website to tell the real story about Robertson and where I could defend the employees Robertson was attacking...someplace that he couldn't whitewash and censor. That place became, and is, Freespire.com. Understandably, given Robertson's unflattering history, he doesn't want the facts shared at Freespire.com to be public, but unlike Wikipedia which he could censor directly, he had no influence at Freespire.com. So, instead, he did what many wealthy, unethical men do, and tried to squash my free speech by filing a lawsuit against me and Freespire.com. My lawyer estimates that Robertson spent over $100,000 on the Freespire case (including a motion for summary judgment which he lost last year). I didn't spend even a small fraction of that. There's a saying among lawyers, "If the law is on your side, argue the law. If the facts are on your side, argue the facts. If neither are on your side, pound on the table." Robertson paid dearly for a lot of table pounding. =) Both the law and the facts were unquestionably on my side. 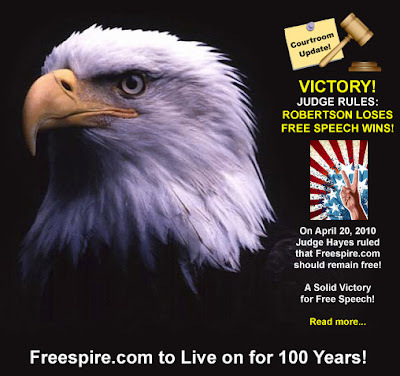 Time and time again the courts have protected sites such as Freespire.com, for to do otherwise would be an infringement on one's freedom of speech (something Robertson pretends to care about, except when it comes to the free speech of others talking ABOUT HIM =). This made defending this case very easy, and very little work was needed or done on our part, but for Robertson, well, let's just say table pounding can be very expensive! The day before the trial, my lawyer, Gil Cabrera, called me and asked if I wanted to get together before the trial and go over anything and do any prep. I told him, "We won't need any. If we stick with the facts and law, we win, and I know you're a pro at that. Let's let Robertson waste his money and put his lawyers' kids through college. I have better things to do with my money." I then told Gil that I'd meet him at his office a few minutes before the trial, and we'd walk over to the courthouse together. (Gil's office is only a couple of blocks away.) I told him that we'd prepare as we walked over. That's it. That's all the prep we did. I knew this was likely the least a client had ever let Gil prepare for a trial, but I told him he was good enough, and our case strong enough, it wouldn't matter. They finally got things sorted out and Ed was able to read the big zinger. Yawwwnnn. What a let down, just more nonsense. And so the trial went on...and on....AND ON, blah, blah, innuendo after innuendo being made by Robertson's team. A case that should have taken an hour or two, Robertson and Co. dragged on for an entire day, we even stayed past the normal closing time for the court. After the trial, we had to wait a couple of weeks for the Judge to issue her ruling. When it arrived, as expected, it was a complete and total victory for free speech. Robertson lost. Free speech won. Judge Judith Hayes was spot on in her ruling. She didn't miss a thing, and correctly ruled "...the Defendant had a bona fide noncommercial use for the website, the Court finds the general purpose of the website to be a free speech forum wherein Defendant criticized the management of Plaintiff. ..the Defendant at no time harbored a bad faith intent to profit from a registered mark and that his use of the website undertaken to inform consumers and criticize Plaintiff's management constituted a lawful use of the site." Oh, but wait! Michael Objects! For all the money Robertson paid the MULTIPLE Duane Morris attorneys, I'll take my ONE lawyer, Gil Cabrera, any day. Even though I didn't pay him to prepare to anywhere near the extent Robertson did his team, Gil easily won. I didn't pay to let Gil have all the resources that Robertson let Duane Morris ring up (motions for summary judgment, prep time, research, nifty white posters, 27-page objections, multiple attorneys at trial, etc. ), yet in my opinion, he clearly out lawyered them where it counts--in the courtroom. Gil beat Robertson's team with one hand tied behind his back, while Robertson gave his troops a tank. Gil won by sticking to the heart of the issue (non-commercial free speech site), regardless of all the nonsense Robertson's team threw out there. Sure, Gil DID have the law and the facts on his side, but he still did a great job in delivering them, and it's clear by the outcome that the Judge didn't miss a thing. Kudos to Gil for making sure the real issues didn't get buried in the mud Robertson's side was throwing at the wall. I won't be at all surprised if Robertson appeals, as he might still have a little money left. (What's that they say about a fool and his money? ;-) But, I'm happy to see Robertson wasting his money (as I'm sure his attorney Ed Cramp is too =), since I won't be the one spending anything, just like before. Doesn't Robertson understand that the more he attacks, the more attention he just brings to Freespire.com? He spends HIS money to bring more attention to the very thing he's trying to shut down. Doi! Some of us who worked for Robertson have a saying, "Take the smartest, most logical thing to do, and plan on Robertson doing the exact opposite." It's what makes him so predictable. What would be the dumb thing to do here? To appeal and waste more of your money to bring attention to freespire.com. So, what can we expect from Robertson...you got it. Mark my words. Like I say, as predictable as a dumb donkey. The Freespire.com domain name was set to expire next month. I just renewed it for another 10 years. I would have registered it for longer, but that's the max they'd let me go. I suppose they figure that in ten years who knows if "web sites" and "domain names" will even exist. One thing I can assure you, however, no matter what the medium will be in the future, I'll make sure the facts about the REAL Michael Robertson get published, not just for the next 10 years, but for the next 100. If you play We Rule on your iPhone/iPad/iPod, you may find this tip sheet I put together helpful. It will help you know what are the best crops to plant, depending on your time schedule or even if you're spending Mojo. For example, the best crops for earning gold per hour are (in order): Wheat, Corn, Rice, Peas, Onions, Strawberries, Pumpkins, Squash, Potatoes, Carrots, Watermelon, and then Beans. Or, if you have Mojo to spend, and it's XP's you're interested in, then you'll want to go with (in order): Pumpkins, Carrots, Strawberries, Beans, Watermelon, Onions, Potatoes, Squash, Peas, Rice, Wheat, and then Corn. 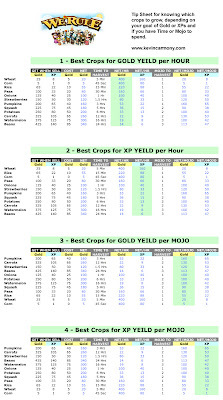 Simply decide what your goal is, look at your inventory, and choose the crop highest up on the list. 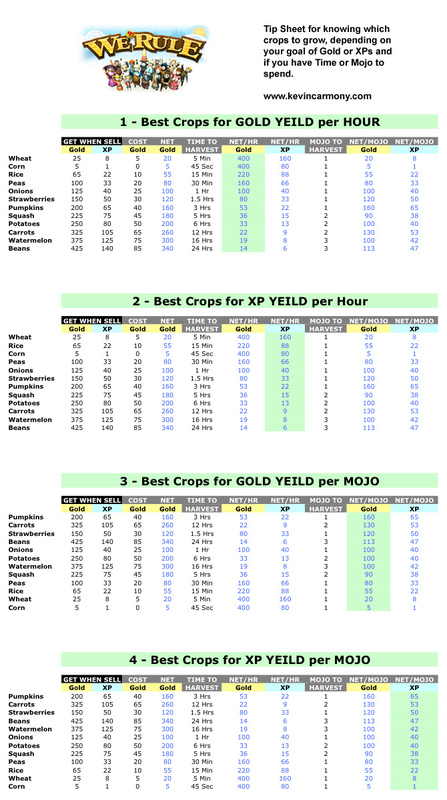 You can then see what your yield per hour or per Mojo will be. I only have included crops for levels 15 and below (as I'm still working my way up to the higher levels myself). When I have all the additional crops for the other levels, I'll update my chart. Click on the chart to blow it up full screen. Enjoy, and pass it around to your friends! My Kingdom (Click to Enlarge). As most of you know, Michael Robertson is continuing his legal attack on some very good people who once worked at Linspire. As part of this legal assault, I have had to produce emails, documents, etc. in discovery. In going through the old emails I had kept, I found one that I thought I would share here. One day Robertson and I were arguing about how to treat employees. I think employees are the most important asset of a company. Robertson yells and swears at them, tries to make them feel small, gives them crappy severance, and even ends up suing them. During one of these "how do you treat employee" arguments, I was trying to explain to him that the employees I was defending had just brought in millions of dollars in revenues and profits. He would always come back with, "Yes, and that's their job. That's what they get paid to do." He then went on to brag about how "he" got $20M from Microsoft years earlier by forcing them into a rough situation where they had to pay us to change our name. See the email I've pasted below which I had sent to Michael Robertson back in 2002. It's an email that I spent a great deal of time and thought on writing before sending it to Robertson. This email, and my subsequent cajoling of Robertson, would end up being worth $20M to Linspire two years after I wrote it. "Lindows" had just gotten a favorable ruling in one of the very early rounds of the Microsoft v Lindows trademark case (a full two years before we actually settled). I remember that day very well, as we heard of the ruling right in the middle of a developer's conference that we were holding at the Lindows offices. (I'm sure many of the developers who were at that conference will remember it too, as it was a big victory for Lindows against the giant Microsoft.) After the ruling, Robertson told me that his plan was to try and settle with Microsoft and change our name to ChoicePC. He figured he could get between $100,000 to $250,000 from Microsoft on the heels of this loss for them and that they would now agree to settle. As you'll be able to see in my email to him, I thought that was a bad idea. Much of the press Lindows had been getting was coming FROM the lawsuit. Without that, we were just one of a thousand other Linux distors. We needed something to help us build our brand. To me, that was the name Lindows. I also knew we had little downside but HUGE upside to one day settle for a lot more. Knowing that you can't easily change Robertson's mind (you have to stroke his ego and make him think everything is HIS idea so he can later take the credit), I crafted this well-thought-out email. The next day, after MR had read my email, we met and I continued by tactfully cajoling him. Robertson then agreed with me and decided not to change our name. I remember the sense of relief I felt when he changed his mind. Whew! I'm quite confident that without this email and my cajoling, Robertson would have settled with Microsoft at that time. The rest is history. We continued to milk the press from the name and ultimately took $20M from Microsoft to change our name. First off, congratulations! Not sure if I actually congratulated you on the ruling, so I'll do it now. Not everyone here was as close to the legal proceedings as I was, so they probably don't fully understand how significant your direction in this case was. I was fortunate to have been able to sit in on many of the meetings, calls, e-mails, etc., and to me it was very clear. Many will congratulate our company over this victory, but I sincerely congratulate you personally. Sure, Brobeck has a good team and did some great work (especially Daniel), but I honestly give the bulk of the credit to you. Like you said over dinner, winning doesn't teach you much, but losing does. Lindows.com is the beneficiary of the experience you gained at MP3.com. 1. Dvorak said it best, "Lindows has a name that in itself is genius." Two names have put this company squarely on the map: "Michael Robertson" and "Lindows." It was a brilliant move then, and I believe still is, for all the same reasons it was "genius" back then and now even more reasons. 2. Yes, ChoicePC is a very good name as well, BUT it doesn't have the history that "Lindows" now has. I believe the name "Lindows" now stands for much more than when we started (Linux + Windows). It now also stands for not being afraid of taking on MS, it now stands for victory, it now stands for the days of MS always getting there way are numbered. Every army needs a banner, an ensign to rally around..."Lindows" I believe has become that ensign...I'd hate to lose it. 3. Today's victory was felt by so many...you, me, Brobeck...but far more important...our employees, our customers, our Insiders, our supporters, investors, the press, fans, etc. I would feel that if we abandon the name now, in a way we're abandoning them and all the trust they've put in you to fight this fight. What will Dvorak think? What will our Insiders think? What will our employees think? So many people have felt a stake in this fight (you heard the cheers during your toast tonight), I don't want to lose their ardent support. 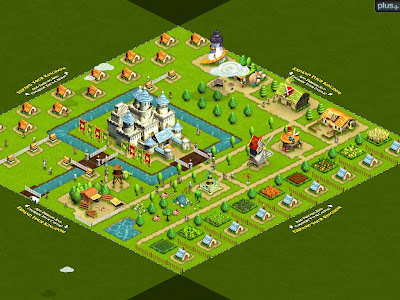 "Lindows" has become the icon of our fight, to bring choice to MS's monopoly. I think it would be a mistake to walk away from that now. 4. I agree we need to focus on making a great product and not fighting legal battles. I believe we've proven we can do this. Our engineering team continues to plow forward, regardless of any legal entanglements. I don't see this a dilution of engineering, but rather a HUGE boost to marketing. I believe we have been handed the best pre-branded name we could possibly have, and it will take much to replace that. Sure, we could work to brand ChoicePC so that everyone comes to know the name...but will the name bring up the same emotions? David V Goliath has served us well in these early days, and I believe there is still steam in that model. 5. We can still introduce the concept of a "ChoicePC" without abandoning Lindows.com or LindowsOS. A "ChoicePC" is one running LindowsOS and shopping at the Lindows.com warehouse. We can gradually brand "choice" while keeping our Lindows banner flying proudly. 6. Lindows has been through the battle and come out victorious (yes, I know this could change, but given such a strong opinion on the PI, I'm feeling confident we will remain victorious.) This battle and victory has injected something into the Lindows name that only another lawsuit could put into ChoicePC. I fear any other lawsuits will be longer fought and perhaps not easily won. We should take this first win and wear it as a badge of honor and courage. As you say, we didn't run when the bully picked on us the first day of school...let's not let MS ever forget that! 7. Finally, I'm exceptionally proud to be associated with this company, and I know all the employees here feel the same way. Lindows is now such a huge part of that pride and our legacy...I don't want to walk away from that. I bet if you took a vote of our employees, 100% would agree. Even if it's not the logical thing to do, it IS the emotional one...and emotions are a powerful thing when trying to get employees to love a company. You instinctively KNEW that "Lindows" was the right name when we started, just like MP3.com was the right name. My instincts are screaming to me it is even a more brilliant name now. Just wanted to share my insight as you consider this decision. Congratulations again! I hope you take some time to cherish the moment...not many can say the took on MS and won. Just wanted to make sure Robertson doesn't try re-writing history. Robertson likes taking the good ideas from employees (read this for example), but then treats them poorly, like pawns in his little world. Just ask most of those who have had the misfortune of having worked for him (or been sued by him). During my lifetime, I've been truly blown away more times by Apple than any other company. They've done it to me five times now. I can still remember the very first time I ran each of these devices from Apple: Apple IIe, iPod/iTunes, iPhone, and the Mac. Each time I was completely blown away, giddy even, with the sizable leap in innovation with each of these products. Well, it happened to be again yesterday, when my iPad was delivered to my home. I spent a good portion of the day using it. And I have to say, I love it. It exceeded my expectations. Sure, I expected it to be nice, but in a way my expectations were kept in check, given I have owned the iPhone since the day it came out. I guess in a way I was expecting it to be just an iPhone, only bigger. I found it to be so much more. The larger screen allows iPad apps to be much nicer than their iPhone counterpart. They aren't just marginally better and easier to use, but a magnitude better. With a few taps I was streaming full-length TV shows in beautiful clarity. Photo viewing, web browsing and email have never been so enjoyable. Games are amazing. It's the ideal device to use while watching TV, laying in bed, and certainly to watch movies while traveling. It's not perfect, no 1st generation product is. Just like with the iPhone, I'm sure it will improve each year. But, this first product is far enough along for me to already know I wouldn't want to not have one. Anyone who waits for the next generation of the iPad will miss out on all the amazing things it can do right now. For those of you skeptical about "do I really need a device between my iPhone and laptop?" You'll see. You do. And you will be getting an iPad. 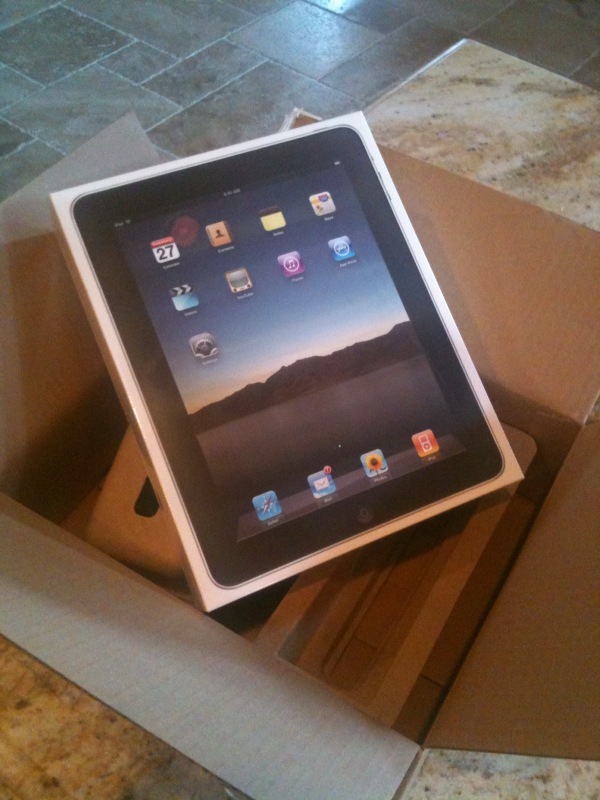 The iPad will be big. That's my prediction. Apple has done it again. PS: As some of you may know, my company has five different apps in the Top 100 of the iPhone app store (social networking). We just submitted our first iPad-optimized app, CLIPish for iPad, and it should be available any day in the app store. Look for it.